San Diego Humane Society Celebrates "St. Pitty's Day"
The San Diego Humane Society celebrated Saint Pitty's Day Thursday with reduced adoption fees for some dogs. 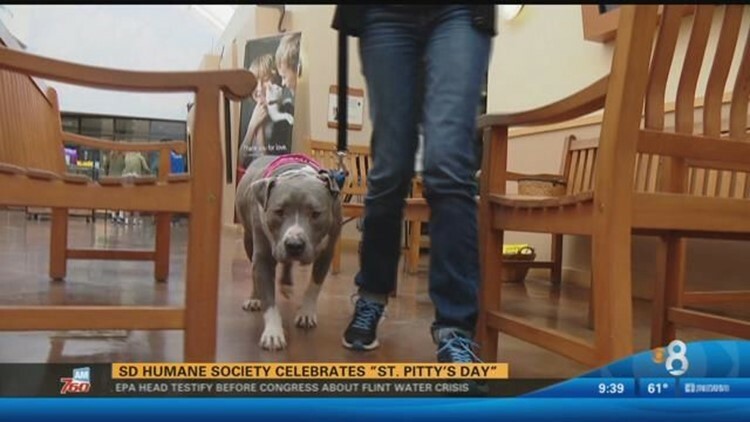 SAN DIEGO (CBS 8) - The San Diego Humane Society celebrated Saint Pitty's Day Thursday with reduced adoption fees for some dogs. In honor of Saint Patrick's Day, all American pit bull terrier mixes were available for adoption for just $17. Workers at the Humane Society say they want to encourage anyone looking to adopt to consider a pit bull. There are currently more than 500 animals at the San Diego Humane Society's three campuses and satellite adoption centers.